"Don`t think I`ve seen Fred since I graduated from KHS in..."
"Audrey & family sorry to read of the loss of Fred. He..."
"Mrs Graham, Kim, Kathy, Keith and Kevin, My Prayers and..."
"Heartfelt sympathy to the Graham family. 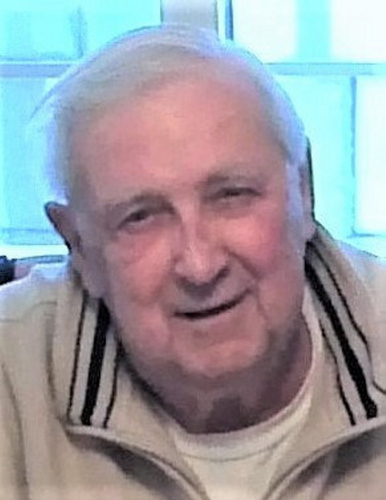 Fred was a great..."
"My sincere sympathy to the entire Graham Family in the loss..."
Fred A. Graham, 84, of Wilkes-Barre, passed away Monday, April 15, 2019, in the inpatient unit of Residential Hospice at Geisinger South, Wilkes-Barre. Born in Jenkins Twp. on Jan. 22, 1935, Fred was the son of the late Hamilton and Thelma Harding Graham. After the military, Fred's career consisted of being a purchasing agent with Craft Associates and Comfort Design. Following these roles, he was the superintendent of Mount Olivet Cemetery, Carverton section of Wyoming, for the Diocese of Scranton, for over 25 years. After retirement, Fred provided student transport for Wilkes University until 2015. Fred was very active in his community, church and fraternal organizations. As his children were growing, he was a coach in the North End Little League and Athletic Director for Group 7 of the Slovak Catholic Sokols. He was a member of the former Sacred Heart of Jesus Church in North Wilkes-Barre and most recently Ss. Peter & Paul Church, Plains Twp. Fred was a member of the Knights of Columbus, Alhambra, North End Slovak Club, Polish American Veterans Club, Henry Citizens Club, American Legion, and the Slovak Catholic Sokols. In 2013, Fred was named the Slovak Catholic Sokols Fraternalist of the Year and was a former past president. In life, Fred loved playing cards, woodworking, yardwork, coaching, travel to Sokol events and spending time with his family and friends. In addition to his parents, he was preceded in death by his brother, John Graham. Fred is survived by his wife, the former Audrey A. Fedor, daughter of Andrew and Anna Keblish Fedor. They were married on May 19, 1956, and had shared 62 years of married life. They raised four children together and have been blessed with five grandchildren. He will be lovingly remembered by his daughter, Kim Graham, and her fiancé, Dave Domzalski, Dallas; son, Keith Graham and wife, Mary Beth, Hudson; daughter, Kathy Graham, Plains Twp. ; and son, Kevin Graham and wife, Denise, Belvidere, N.J.; grandchildren, Justin, Kyle, Cody, Karina and Kylie; sister, Shirley Pritchard, Tucson, Ariz.; and several nieces and nephews. Fred's family would like to offer a special thank you to Dr. Jessica Zingaretti and the nurses of the 4th Floor at Geisinger (RM 412B) and the nurses and staff at Residential Hospice for the wonderful care and compassion given to Fred. The funeral will be held at 9:30 a.m. Wednesday at Corcoran Funeral Home Inc., 20 S. Main St., Plains Twp., with a Mass of Christian Burial at 10 a.m. in Ss. Peter & Paul Church, 13 Hudson Road, Plains Twp., with the Rev. John C. Lambert, pastor, officiating. Friends and family may call from 5 to 7 p.m. Tuesday at the funeral home. Memorial contributions may be made to the Residential Hospice c/o 601 Wyoming Ave., Kingston, PA 18704, in Fred's memory. For information or to leave Fred's family a message of condolence, please visit www.corcoranfuneralhome.com.